I don't yet know how, in my Sunday sermon, I will approach the gospel text about the raising of Lazarus (John 11: 1-45). 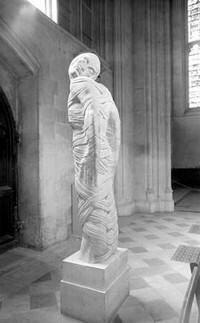 However, there may be food for thought in Jacob Epstein's sculptural representation of Lazarus, bound with strips of cloth, after Jesus called him out of the tomb. I saw this in 1979 in the chapel of New College, Oxford, when my college choir was touring England. Obviously, it left a lasting impression on me.